If you're new to #COLLABOREADS, welcome! Every month, Kristin from Taz + Belly and I have hosted this fun little book-loving link-up, and we're so happy you've stopped by this round! Here's how it works: We pick a theme, you pick a book that fits (we all read different books! it's fun that way!) and then all link up and share our thoughts (with a handy-dandy R.E.A.D.S. acronym usually--see below!) and link up and become BFFs. You can read more about this whole thing here. It's bittersweet, but this is the last month of our little #COLLABOREADS link-up. I have loved hosting this endeavor for so many months, but with a new year comes new things! Starting in January, we will be adding a link-up to our monthly book review blog posts and inviting you to join us with yours! It's called Book by Book, it's a monthly linkup ALL about books, and we are SO excited about it! The first Tuesday of every month, we'll share the past month's book reviews (like so many of us do monthly anyway!) and create a space where you can share your own post and find many other book-loving bloggers to follow, too! We'll even in throw in some #COLLABOREADS-ish prompts for each month if you want an added bonus for your reading-- it isn't required, but we know some of you were loving those prompts, so we wanted to keep them coming. We are so excited about this new book link-up and hope that it will be a fun addition to your bookish blogging in this new year! We want you to join us for Book by Book! 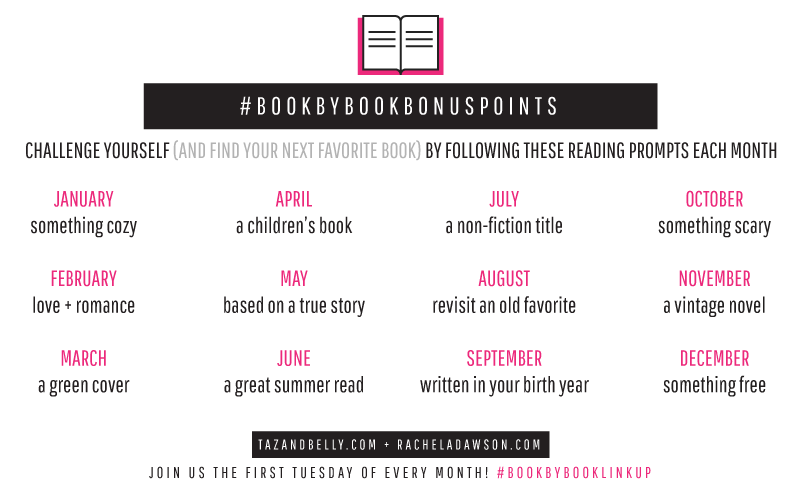 Even if you never blog about books, you can join in on the fun using the hashtag #bookbybooklinkup on Instagram on your book review posts! If you have any questions, just leave a comment below and we'll answer ASAP! And now, for our last round of #COLLABOREADS! You can grab this book HERE! (affiliate links are here and throughout this post!). Thanks to BookLook Bloggers for sending me this one for free to review! What part of the book could you NOT get enough of? This book will change your life. Enough said. ...But I'll say more... This book was one I have heard about for years, but resisted reading. (That totally should have been a sign I needed to read it!) No matter who you are, what relationships you have, or what your personality is like, this book will absolutely help you to create boundaries in the best ways, in order to help you (and others) live your best life. It's helpful, encouraging, wise, and thorough. This book helped dispel any myth you might be believing about setting boundaries, and it gave such helpful perspectives on what healthy, solid boundaries look like. I appreciated how many stories and anecdotes were included-- it made it feel like there was less pressure on me, and that I wasn't alone in the need for creating better structure and boundaries in my own life, work, and relationships. I'll be changing and implementing so many things in my life because of this book, and I know I'll be so much better for it. How did you relate to/care for the characters? What's your thought on the plot line and twists and turns? There aren't characters here as it was a non-fiction book, and there wasn't really a "plot" but I will say that the anecdote and stories told about many different people, and the structure in which this book was organized were both really wonderfully crafted and made this reading experience a great one. What other books are like this one? If none, did it remind you of a particular TV or movie with it's themes and characters? Does it serendipitous-ly line-up with things going on in your life or the news right now? It's similar to books like Better than Before (Gretchen Rubin), The Road to Character (David Brooks), and other self-help types of nonfiction. You know you judged this book by the cover. What did you think of it? How did it relate to the contents of the novel? And the font and layout of the pages? This cover is classic and relates completely to the topic of this book, so I think it's spot on! How many out of five do you give this book? Would you recommend this book to a friend? This one got 4/5 stars from me! We're skipping the link up this month to prepare for our new monthly book-ish linkup launching in January! If you loved our monthly #COLLABOREADS prompts, don't worry! We're keeping them alive for Book by Book, as an added bonus and a fun way to add something new to your reading each month. Join us with your book review blog post (or ANY kind of bookish blog post!) on January 2! Link up either here or on Kristin's site. We'll be reading and commenting and can't wait to talk books! If you want a bonus: read "something cozy" this month! How Did My Reading Challenge Turn Out?